Radiant heat and moisture build up are an attic's worst enemy, working together to cause a variety of problems for your home. In many cases passive ventilation is simply inadequate in controlling these elements, resulting in high electricity bills and accelerated deterioration of building materials over time. Attic Breeze residential solar powered ventilation products provide a cost effective solution to this problem by continuously removing heat and moisture build up throughout the day. Completing existing attic insulation, our solar attic fans actively remove hot air and humidity to reduce the attic temperature. Minimizing attic temperatures will increase the overall efficiency of your attic insulation and reduce the amount of heat transferred into your home. The result is a more comfortable home which requires less energy to cool. Best of all, Attic Breeze products operate at absolutely no cost, cooling your home using only solar power. 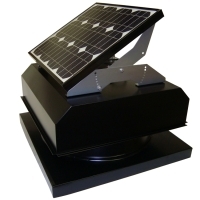 The Attic Breeze AB-204A solar attic vent features a 20 watt attached solar panel, corrosion resistant zincalume alloy vent housing, ultra-quiet 14 inch fan, thermal switch, rodent guard, and a heavy-duty painted finish (available in black, brown, or gray). This attic vent will move up to 1350 CFM of hot attic air in full sun exposure. The curb-mount vent housing of the AB-203 and AB-204 models is most appropriate for either tile or metal roofs. The AB-204A solar attic vent is designed to work best for homes with a good southern-southwestern exposure for the desired attic vent installation. Reduces cooling costs by minimizing the heat load on air conditioning equipment. Lowers attic temperatures resulting in a more comfortable home. Works to eliminate mold and humidity by actively removing moisture build up. Helps to prevent ice damming problems in colder climates. Environmentally friendly solar-powered design, without need for electricity. Designed for easy installation delivering immediate results. Federal tax credit available, as well as state and local incentives in certain areas.